The 2016 Award Circuit will be a collection of reviews of films that are in some kind of award runnings within the months of January through March. Not only will this prepare me for the big night (AKA Oscar Night), but it will also allow me to catch up with some of the critically acclaimed films I missed out on in 2016. I hope you enjoy reading them as much as I enjoy watching and writing them. "Deepwater Horizon" may not be up for any major acting, writing or directing awards. On Sunday, it will be up for Best Sound Editing and Best Visual Effects. Its not the type of movie that makes Oscar voters jump up and pay attention, except when it comes to lots of the technical issues. No matter, I thought "Deepwater Horizon" is a wondrous disaster movie. A powerful film about survivalism. A movie that is filled with great performances by an all-star cast, even if they go unrecognized by the Academy. "Deepwater Horizon" tells the true story of the Deepwater Horizon blowout of 2010. The Deepwater Horizon, an oil drilling rig operated by private contractor Transocean, is set to begin drilling off the southern coast of Louisiana on behalf of BP. Chief Electronics Technician Michael "Mike" Williams (Mark Wahlberg) and rig supervisor James "Jimmy" Harrell (Kurt Russell) are surprised to learn that the workers assigned to pour the concrete foundation intended to keep the well stable are being sent home early without conducting a pressure test, at the insistence of BP managers Donald Vidrine (John Malkovich) and Robert Kaluza (Brad Leland). While Mike prepares the drilling team, including Caleb Holloway (Dylan O'Brien), Harrell meets with Vidrine and persuades him to conduct a test, which only serves to weaken the already-crumbling foundation further. His patience thinning, and without waiting for Harrell to confirm the results, Vidrine orders the well to be opened. This results in a massive blowout that claimed the lives of eleven men working on the rig. "Deepwater Horizon" features some very good visual effects, I will say that they don't exist throughout the entire film. There is a moment in the film that features a flying pelican and is dying from the oil spill. Its such a preposterously fake scene that it nearly took me out of the movie. Its interesting too, because most of the rest of the films visual effects pieces are very good. The fire and the upcoming disaster is well done. This feels like a authentic disaster. Director Peter Berg's realistic eye is on full display here, and he puts in great detail in other shots, its just in that moment, he looses it. It felt like a moment from a different film, and that's never a good thing. The Sound Editing is also very good. The sound is also given an astounding realistic treatment here, and it elevates the material here. 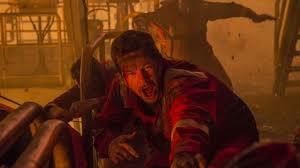 I am not sure if "Deepwater Horizon" will end up getting the Visual Effect award, simply based on how bad that pelican scene is and just how good they are in "Doctor Strange." However, it could very well win it for Sound Editing. "Deepwater Horizon" should have got nominated for both Cinematography and Sound Mixing as well, and they'd put up good competition. The all-star cast does good work. Mark Walhberg is beginning to show that he isn't just some kind of fluke who only works well when its in his best interest. Over the last few years, he is starting to become a full fledged performer now. This part of his career is really on the up, and I can't wait to see where it leads him. Any movie that can make Kate Hudson vaguely interesting also deserves some praise and credit. She isn't in the movie a lot, but she shines when she's here. Kurt Russell is very good here. John Malkovich plays a typical good antagonist, even though he should have been twirling his mustache a little bit more. There is never much to disaster movies, they follow the same list of cliches like most genre movies do. "Deepwater Horizon" is a list of cliches, but the good acting, good technical merits and brilliant cinematography makes this an experience that is better than most. We don't get a whole lot of straight-up disaster movies these days, so it was refreshing to see. If you haven't seen it yet, give it a rent.